Provide comfort for the family of Dolores Ostrowski with a meaningful gesture of sympathy. (nee Bauer) Was born on January 11, 1930 at home in Milwaukee, WI to William and Clara Bauer. She passed away on December 17, 2018 and was reunited with the love of her life, the late Robert G. Ostrowski, whom she met while working at Slutsky’s, a local grocery store in the now Riverwest neighborhood. Of all of Dolores’ joys, her greatest lifelong passion will always be her love of Bob. 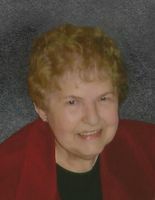 Dolores had a career as a professional secretary for the Wisconsin Rating Bureau, where she worked for 15 years before leaving to have her first and only child. When her husband died suddenly at age 52, she joined the workforce again and started a 30-year retail career where she worked for Gimbels and Boston Store. She retired in 2004 to care for her first grandchild full-time. In Dolores’ 88 years, she shared her deep faith, great love of family and the Christmas season, passion for cooking, baking, going to the movies and going out for a good steak, her laughter, sense of humor, and joy with us all. I give thanks to God for my precious mom, the most caring, loving, selfless person I’ve ever known. Loving mother of Renee Ostrowski-Weber. Proud grandma of Michele, Julia and Robert Weber. Dear sister of the late Robert (Irene) Bauer. Fond sister-in-law of Melvin Ostrowski, and the late Elaine and the late George (the late Helen) Ostrowski. Further loved by many nieces, nephews, cousins, other relatives and friends. She will be remembered as a devoted and loving wife, mother, grandmother, sister, and friend. Visitation Saturday, December 29, from 9:30-10:30 AM. Service Saturday 10:30 AM from the Funeral Home to St. Mary’s Visitation Catholic Parish, 1260 Church St., Elm Grove, for Mass of Christian Burial at 11:00 AM. Interment to follow at Holy Cross Cemetery. In lieu of flowers, monetary donations for medical and household bills as well as funeral expenses would be much appreciated and can be given to the family or sent to the Schramka Funeral Home. To send flowers in memory of Dolores L. "Dolly" Ostrowski, please visit our Heartfelt Sympathies Store. Service at 10:30 AM from the Funeral Home to St. Mary's Visitation Parish for 11:00 AM Mass. Process to cemetery after Mass. Provide comfort for the family of Dolores L. "Dolly" Ostrowski by sending flowers. Please accept this note of sympathy regarding the loss of Dolly. May the God of all Comfort give you real comfort from the Scriptures. The Bible can be a real source of comfort. It tells us what happens to our loved ones when they die (Eccl 9:5,10), and it tells of the hope of a resurrection where God will bring our loved ones back to life on a paradise Earth, free from sickness (Acts 24:15). I warmly encourage you to visit jw.org to find out more about God's trustworthy promise of the resurrection. Best wishes to you & your family.